A version of C.I.A. Lacing using U-Lace no-tie laces instead of regular shoelaces. Uses one or more visible crossovers at different positions for covert signalling. • The bottom row of eyelets is simply laced straight across with a single U-Lace segment. • Use two U-Lace segments to lace the next two higher rows of eyelets with an "X", one segment running up and left, the other running up and right. • The three remaining rows of eyelets are each simply laced straight across with single U-Lace segments. • The bottom two row of eyelets are each simply laced straight across with single U-Lace segments. • The two remaining rows of eyelets are each simply laced straight across with single U-Lace segments. • The bottom three row of eyelets are each simply laced straight across with single U-Lace segments. • The top row of eyelets is simply laced straight across with a single U-Lace segment. • Use two U-Lace segments to lace the bottom two rows of eyelets with an "X", one segment running up and left, the other running up and right. • The next higher row of eyelets is simply laced straight across with a single U-Lace segment. 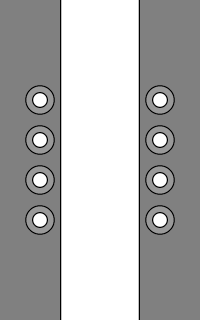 • Use two U-Lace segments to lace the next two higher rows of eyelets with a second "X". 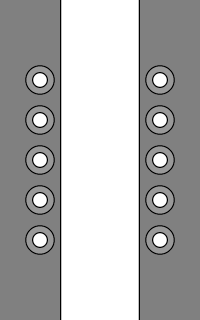 • Use another two U-Lace segments to similarly lace the next two higher rows of eyelets with a second "X". 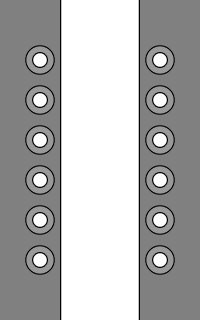 • Use another two U-Lace segments to similarly lace the middle two rows of eyelets with a second "X". • Use another two U-Lace segments to similarly lace the top two rows of eyelets with a final "X". • The remaining rows of eyelets are each simply laced straight across with single U-Lace segments. • This set of seven methods was originally included in the secret manual "Recognition Signals", one of two instructional manuals produced for the C.I.A. by noted magician John Mulholland in 1953. Both manuals were declassified in 2007, while in 2009 a book about them was released. • I have attempted to faithfully recreate the seven diagrams kindly supplied to me by author Robert Wallace from his "copy-of-a-copy" of the original manuscripts. 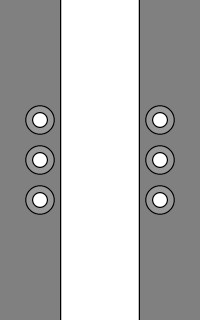 The originals were for shoes with six pairs of eyelets, but can easily be adapted for different numbers (as I have done with the variations for 3, 4 or 5 pairs). • Note that there is no fixed meaning attached to any particular variation. The signals would typically have been agreed upon in advance. For example, it might be agreed that an officer would use Variation 1 to signal "concealed package" or Variation 2 to signal "empty handed". • These methods are designed mainly for use on the types of shoes that C.I.A. officers would have worn in the 1950s, typically Oxfords (Balmorals) where the sides of the shoes meet in the middle (as seen in the regular C.I.A. Lacing gallery). On such shoes, the underlying mess of laces would have been hidden on the inside, making it somewhat easier to spot the visible "signal" crossovers on the outside. • Use the same U-Lace color throughout to replicate the look of a regular, single shoelace and to ensure that the covert signalling is not too obvious. • Use different color U-Lace segments for the crossover in order to make the signalling more obvious (although less covert). Converse Chuck Taylor All Star Syde Street Leather Mids with U-Lace C.I.A. Lacing.